Dr Cynthia founder of the Mae Tao Clinic on the Thai Burma border that provides free health care to as many 140,000 refugees and migrant workers from Burma each year celebrated her 55th birthday on Saturday 6 December by planting the same number of trees and called on the international community to continue funding border projects. Dr Cynthia’s Mae Tao Clinic started life as little more than a shed. Today MTC has dozens of staff and treats tens of thousands of patients each year. Dr Cynthia because of her work has received more than 20 awards worldwide. Speaking at her birthday celebrations Dr Cynthia said. “I would like to say that I am very happy that I could celebrate my birthday ceremony with my fellow workers, the local community leaders, the students, education organizations and women organizations. In particular, I am pleased that we can provide the education and healthcare services because of the support of the ethnic people, both from Burma and Thailand and also because of the support of the Thai people. Dr Cynthia stressed that it was important for the international community to continue funding projects along the border. Dr. Cynthia said that for the moment the border region still needed the financial support for the conceivable future as Burma’s threadbare health care and education system forced people across the border for help. Dr.Cynthia stressed that more people needed to be doing more good for the community. 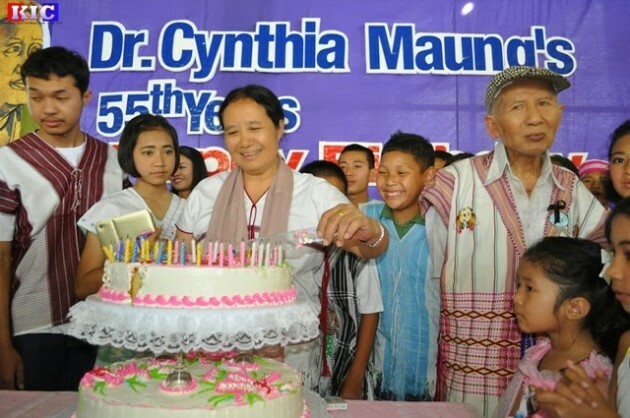 Attending Dr Cynthia’s birthday celebrations were representatives of the Karen National Union, Karen Youth Organization, Karen Women’s Organization, Thai authorities and many community based organisations and NGOs. A total of over 300 people attended the ceremony and among those were students who performed traditional dance at the celebration while others delivered speeches. Dr Cynthia planted 55 trees, each one representing a year of her life, as a symbol of encouraging young people to take care of the environment.